Our first ripe redhaven peach. Sweet, tangy and juicy. 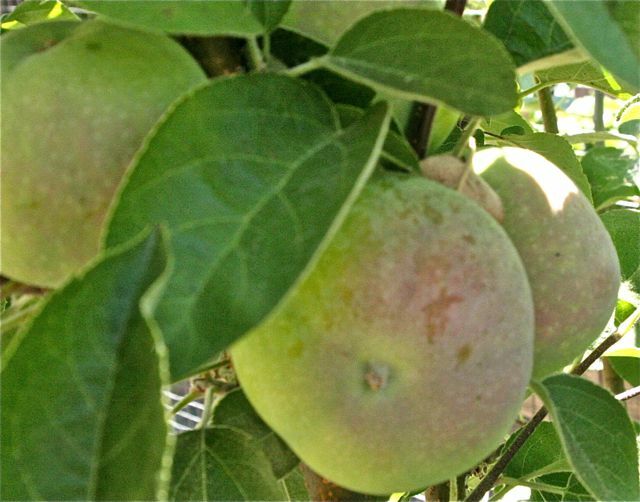 Our redhaven peach trees are heavy with fruit- the nets are paying off. Our days away from the garden certainly came with a few surprises. 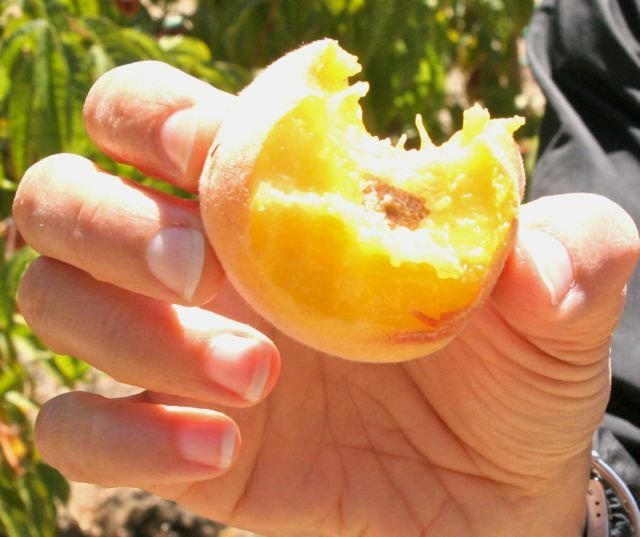 The big surprise is that some of our redhaven peaches are already ripe with others on the cusp! Wow- very tasty, very cool and very rewarding. The netting on the trees really paid off, the trees are brimming with fruit. We just posted a peach cocktail, but expect many peach recipes in the coming weeks. Summer is really here. Unexpected, but welcome mission figs. Macintosh apples starting to color. Another very pleasant surprise is the mission figs. We planted a more mature tree after gophers killed the last one. We did not expect fruit this year, but it looks like we have it. Same thing for the Macintosh apple tree, we have quite a few apples on a young tree- way beyond expectations. We are very grateful for the luck we have, as we all know the garden can also dish up some disappointments. Artichoke blossom there are bees in there, look closely. One happy, but expected, development is the blooming of the artichokes. The blossoms are one of our all-time favorites, the color just pops. Nothing quite like it- and the bees agree, they love the artichoke blossoms and literally dive in. The thin purple needles of the flower constantly move with the bees. After giving us so many tasty artichokes to eat, the plant still gives us (and the bees) something extra, something special. Delightful. 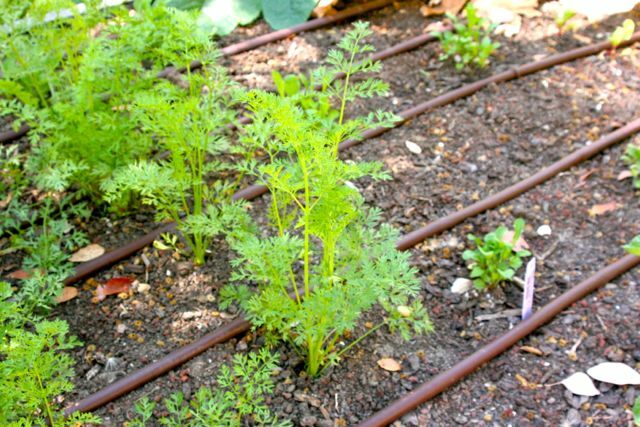 Carrots growing but still need more time. 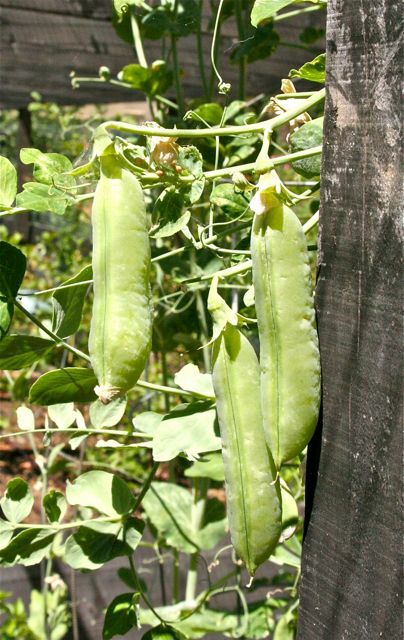 Sugar snap peas. We just had these at lunch. 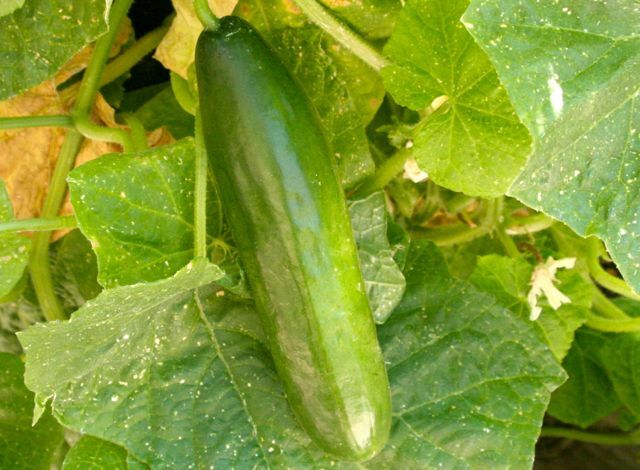 Cucumbers are coming- pickles are not far behind. 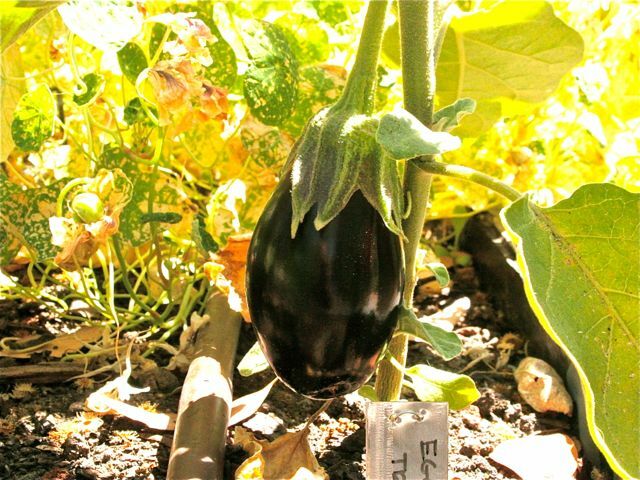 Eggplant coming along- but still a way to go. As for the rest of the garden, summer is in full swing. Our sugar-snap peas, zucchini and strawberries are at their peak. Cucumbers and sweet peppers are on the cusp. 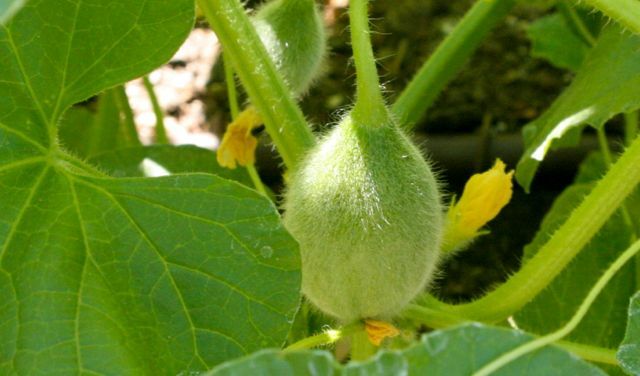 Melons, beans, eggplant and tomatoes are still weeks away. Blueberries and most lettuces are in decline. Sun and heat rule the days, cool breezes fill the night and each new day brings more surprises. 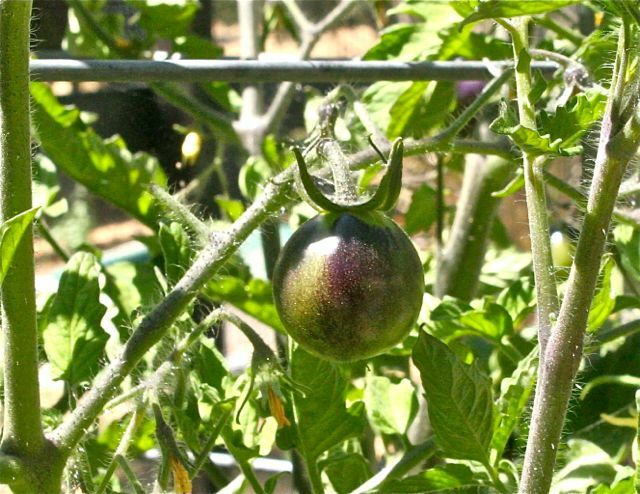 Purple tomato. Mystery variety (the kids bought the plant at town garden sale). Melons are way out- but good to see them growing. 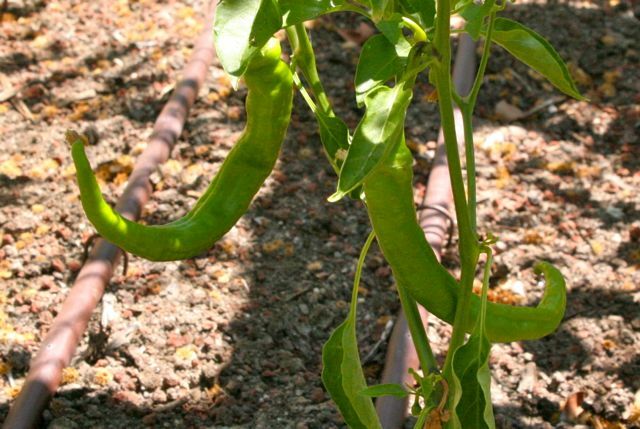 Jimmy Nardello peppers- eating these with dinner tonight. 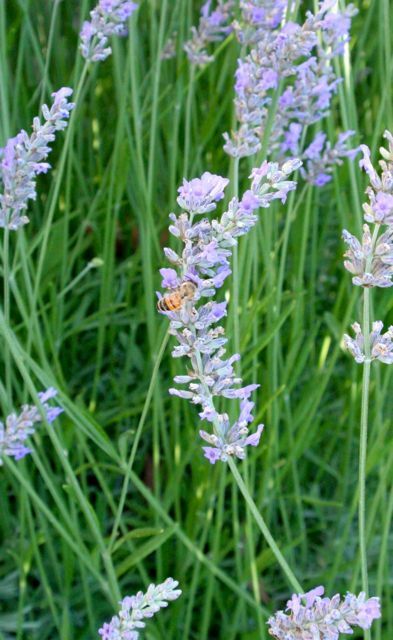 We leave you with bees and lavender…. And you have figs…an under-rated and underutilized fruit, I believe. I cannot wait until they are ripe here in SC. And that is a pretty peach – being a South Carolinian I love those too. Your farm is wonderful! Thanks. The figs and the peaches have been some work (the varmints just love our fruit) but it is paying off. The peaches are pretty small but the flavor is great. And yes, figs can be underutilized, but between salad, desserts and serving with serrano or proscuitto, they don’t last long around here. Great photos! 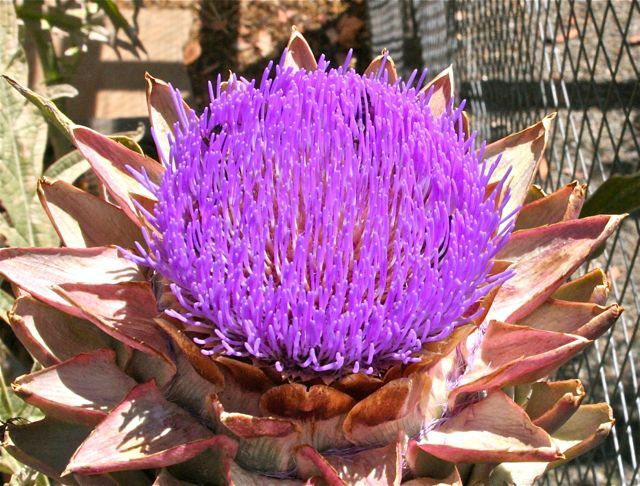 I’ve never seen artichoke blooms before – they’re gorgeous! Thanks, the artichokes are truly amazing. Worth planting just for the flowers. Love the garden photos, always! Many thanks. Enjoying our peaches! You have a beautiful garden. Last summer I worked at a community garden which I miss so much. I never realized how much work is put in to maintain a garden until I worked at a community garden. Do you donate some of the produce or keep it for yourself? Is your produce organic? The garden is work, but somewhat variable. Right now the work load is light and we get to enjoy it. Most of the “work” is picking and cooking- fun stuff. We are organic except one of the older apple trees that needed some help to fight blight. Right now we are small enough that we eat almost everything we grow or can share / trade with friends. If the orchard keeps growing we may be able to donate, which would be very cool. It all looks amazing–especially those figs! Great seeing your photos and commentary. I’ve also never seen artichoke blossoms before – spectacular. And VERY exciting to see that you have Macintosh apples growing. They are my favorite var. Peaches look incredible. Well done! Thanks! 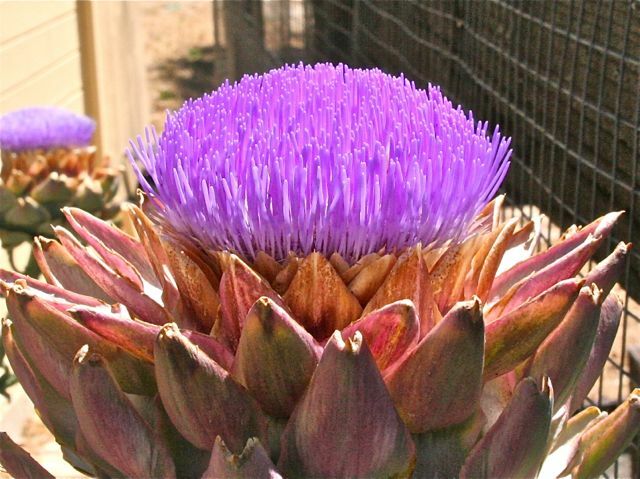 The artichoke blossoms are so cool- we are happy to share them. We are very excited for both the peaches and the apples. The orchard is really taking off. Thank you for sharing your gorgeous garden with us. 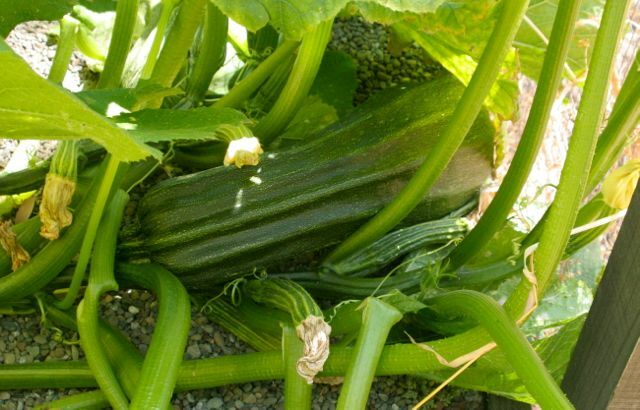 Funny thing about the zucchini- they were letting us down and suddenly they took off. More capricious than we think. It’s just when they grow, they really grow… And maybe 3 are enough, usually friends, neighbors and the farmers market can’t get rid of them.. Thanks for sharing, I love the photos and makes me hunger for a bite of everything. But I must say you had me at the first photo of the peach which is my absolute favorite fruit! Oh, I’m speechless. You’re truly gifted. Keep up the good work. Thanks for reading! Most appreciated! 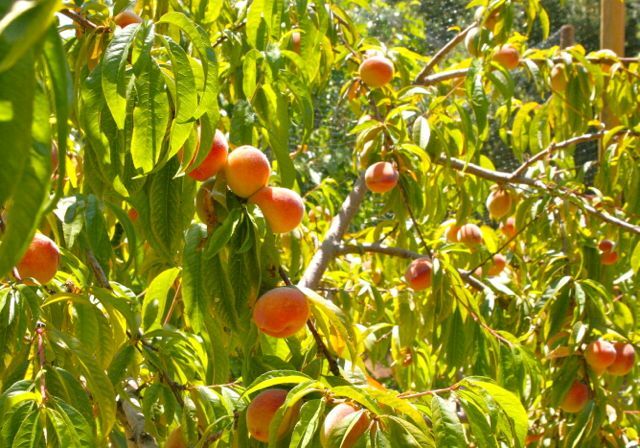 Lovely to see how things are growing – and what a tasty treat, fresh peaches! Wonderful photo’s, I can almost feel the sunny warmth as I sit here shivering by the sea in Northern France! 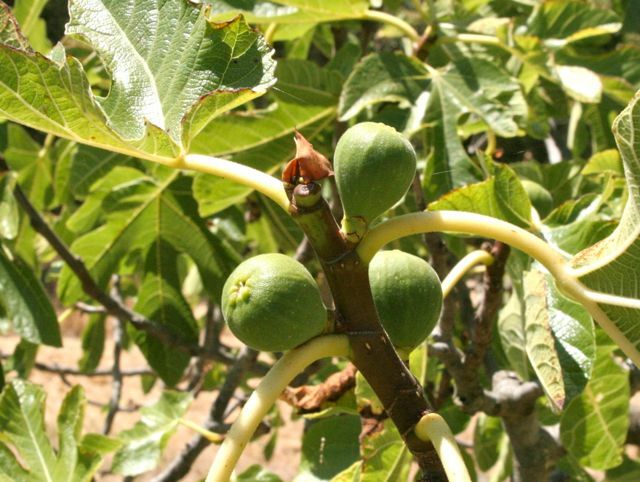 Figs …. 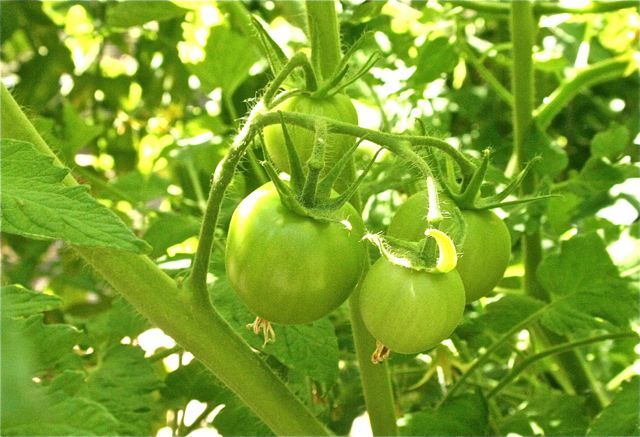 one of my favorite fruits … your garden are out of the world. Thanks for showing me the Artichoke blossom, never seen one before. Thanks for sharing your fantastic world with me.